Yesterday evening, we had a most enjoyable conversation with renowned American master artist John Nieto at the reception opening his show at Altamira Fine Art in Jackson, Wyoming. 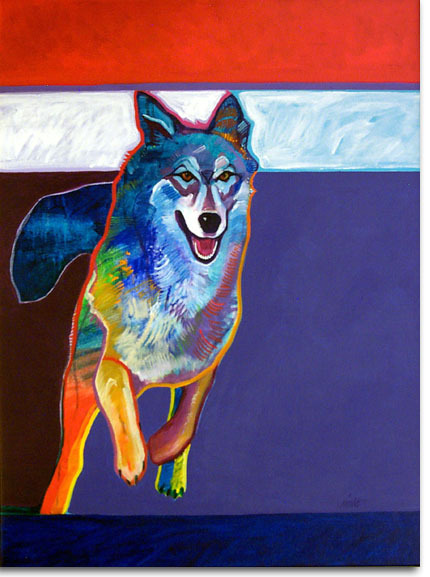 The show includes 30 acrylic paintings of what he loves to portray – Native Americans and wildlife. He continues to expand an exceptional body of work with his paintings, primarily but not exclusively of Southwestern themes informed by his life. The interface of history and memory focused our conversation, and John solemnly noted the great responsibility of historians to maintain fidelity with Truth. One of his paintings is of a Native American from a photograph taken soon after the introduction of the camera to America subsequent to 1826, painted from the inspiration of a very small monotone print he had found. The subject of the portrait, and his photographer, had no conception of the influence that the photograph would have on someone’s life 184 years later. Little do we know, or even consider, how our own actions and work, recorded today in some media or in the minds of those around us, will affect – and hopefully teach or inspire – those who might retrieve it in some form 184 years from now! I shared my fascination with the import of Aldo Rossi’s aphorism, “Where memory ends, history begins”, and we discussed how much of that memory of people, places, things and events correctly informs recorded history. Unfortunately, we have have been and continue to be mislead by both, as I characterize it, “True Tales of the Legendary Past” and misrepresentations – intentional or not – of current events. We gain and learn from Recapitulation, not through stirring the embers of regret but through conscious, informed remembrance projected forward with honesty. That requires quite a bit of “excavation” sometimes, and an absolute determination to understand the context of what we find. John recalled that when he was about three years old, he asked his mother – then around twenty-six years old – how long she expected to live! She replied “Until about 30”. She is still enjoying life at age 93! Some years ago, John found the one room adobe where his father had been raised, a small building long collapsed in upon itself. He dug down inside – excavating the past – and at a depth of three feet found the remains of the old metal desk his father had described to him. Faithful memory and physical evidence of history intertwined and came alive again. What have you learned from the past? Was it learned from personal experience, from the guiding teaching of others, from honest and truthful sources presenting information in correct context? Or was it acquired as a product of faulty or faithless memory and alleged history with a manipulative agenda? What have you done – what process do you use today – to ascertain the worth of the memory and history to which you have access? How will you use your Memory and History to correctly inform the future? We discussed how, in order to understand even a place, to have it inform us how best to relate to it as a means of fulfilling our needs or desires, to comprehend how it has influenced us and others in the past, we need to just sit still on it for a while (sometimes, for a very long while!) until we allow ourselves to see the answer. This very contextual approach is crucial to understanding, and to put the best construction on people as well. This is difficult work, requiring great care and introspection to avoid being another teller of “True Tales of the Legendary Past”, misleading others and ourselves! Mark Tarrant, Director of Altamira Fine Art, described John Nieto’s work, “His work concentrates on themes that transcend mere representation, and his use of intense primary colors, applied in bold strokes, creates both dimension and character on the canvas”. History, careful observation, determination of context, and a passion for incorporating those elements correctly into his art, putting the best construction on his subject matter to inform not only those who see it now, but also those who will first see it 186 years from now – are at the core of his art and his being. From a professional background in architecture, community and regional planning, urban design, leadership, and fine arts, this blog provides insights on ethics, leadership, architecture/planning/urban design, Venice, and whatever intrigues me at the time. Enjoy! This entry was posted in Art, Recapitulation, Reformation, Uncategorized, Zeitgeist and tagged Aldo Rossi, Altamira, Art, History, John Nieto, Memory, Recapitulation. Bookmark the permalink. Bella Figura Communications A public relations agency that specializes in design and architecture, founded by JoAnn Locktov. The Bella Figura Publications imprint is dedicated to publishing books on Venice. The Churches of Venice Jeff Cotton’s fabulous site! A work of art and labor of love! Altamira Fine Arts Premier Jackson Hole art gallery with new gallery in Old Town Scottsdale. Bill Schenck Contemporary art of the Southwest. Chorus Association Chorus Associazione per le chiesa del patriarcho di venezia, working to preserve, conserve, restore and respect the physical heritage of historic churches in Venice. Joshua Tobey Studios Gifted modern sculptor of the animals of the West! The patinas are breathtaking! Marshall Noice Fine art of the New West – shadows and light! Mary Roberson A painter of wildlife who captures a special spirit of the West. Mountain Arts Pottery Excellent hand-crafted pottery and fine coffee and pastries in the combined showroom and “Coffee Pot” cafe, near Bozeman Montana. Overland Gallery of Fine Art, Scottsdale, Arizona Great mix of 21st century contemporary Western American art and 20th Century Russian art. Amazing parallels! Robert Burt Fine Art Art of the Southwest infused with energy, color, mystery, adventure and joy! Sarah J. Webber Fine Art Great work illustrating the animals of the West in a very original style! The Savvy Silkie Fine cooking, photography, travel (especially Italy) and other thoughts! Theodore Waddell Art Works Paintings evocative of Montana ranches, and great illustrated stories with his beloved Bernese Mountain Dogs! Steven Pressfield Renowned author and screenwriter, his “The War of Art” and “Do the Work” are vital helps to overcome Resistance in your creative work. Roger Crowley, Historian “Narrative history at its most enthralling” – Venice, The Mediterranean Sea and more. Mate Winery Near Montalcino, Tuscany, a great vineyard, makers of great wines, creators of fine books and art – Did I mention Great Wine? Bob Sutton – Work Matters Pretty frank talk about why you shouldn’t “suffer fools gladly” and how to avoid being a jerk! Pam Slim – Escape from Cubicle Nation “From corporate prisoner to thriving entrepreneur”. Outstanding! David Allen / "Getting Things Done" An outstanding system for organizing your work! e-Venise A wonderful guide for those with a passion for Venice! Fictional Cities – Venice Jeff Cotton’s encyclopaedic reviews of books and films about Venice. Hello World! Yvonne’s site, a true lover of Venice…and Australia! Joy Singers/Venezia Travato un po’ di tempo per la musica riempira la vostra vita !! Strabella Venexia A wonderful Swedish writer shares her adventures in Venice. The Other Venice Walter Fano shares great stories and illustrations from 1-1/2 millennia of Venice history. Venice Daily Photo Photographs of Venice that are both intriguing and educational! Desert Botanical Garden – Phoenix Arizona USA Focused solely on desert plants since citizen founding in 1939.